Blog Life in China Traditional Food in China – What are the Top Five Traditional Chinese Dishes? Traditional Chinese Food – What is our Top 5? One of the best things about living in, or visiting the middle kingdom is the traditional food in China. 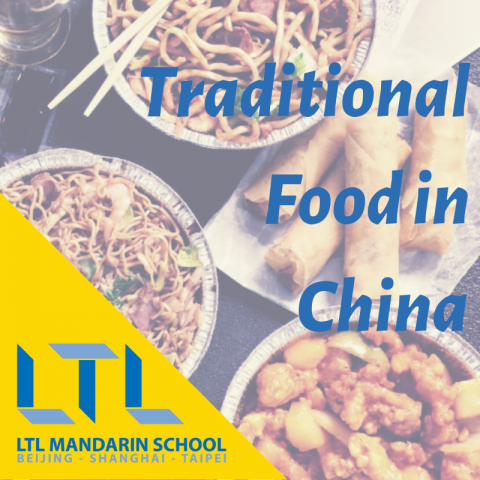 Traditional Chinese food is without doubt one of the most exciting and diverse cuisines in the world. If you think you know your Chinese from your local takeaway back home, think again because it’s like nothing you’ve had before. It’s possible to write thousands of words and endless blogs relating to traditional food in China so we’ll keep this one short and snappy and pick our five favourite traditional foods in China which you MUST try when coming here. DID YOU KNOW – It’s worth noting that every province and region in China has it’s own specialities. Two of the more popular elements of Chinese cuisine are rice and noodles. Noodles are more commonly eaten in the North of China and rice in the South. Each area will have their own variations of these dishes which is what makes traditional Chinese food so diverse and unique. 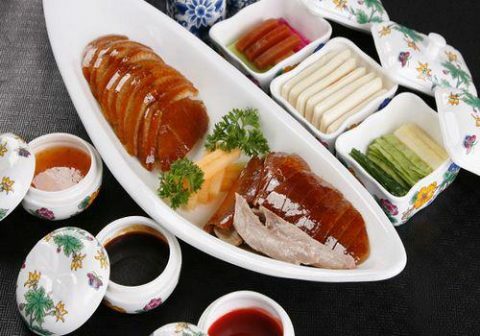 Beijing (or Peking) Duck is a dish that is synonymous with the city of Beijing and is a huge hit with foreigners and locals alike. When you think traditional food in China you think Roast Duck! Generally many western Chinese takeaways offer Beijing duck with small pancakes on their menus but the quality doesn’t come anywhere near the real thing. Beijing Duck is so much more than just Duck. The skin, served with sugar, melts in your mouth. The little sides of cucumber, spring onion (alongside various other surprises). The variety of different sauces you can enjoy in your Duck Pancake such as Sweet Bean and Plum flavours. Every restaurant has their own little variations to this classic dish and you’ll be hard pressed to go wrong. 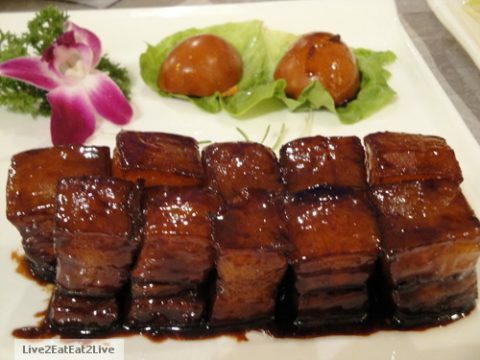 You can enjoy Beijing Duck on the cheap, or if you want to splash out at a more fancy restaurant, you have the option at the likes of Dadong Duck and Quanjude – two of the more famous Chinese Beijing Duck restaurants. The latter was actually formed in Beijing way back in 1864! 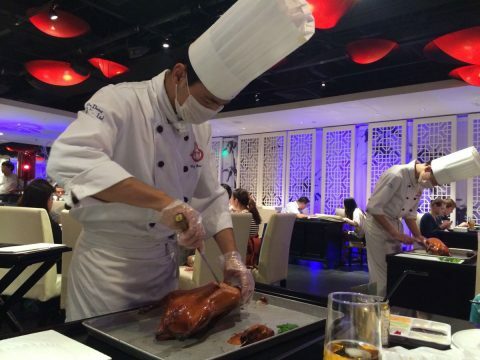 The more high end options will also give you the experience of enjoying the duck being prepared and served in front of your very eyes, a quite unique experience to whet the appetite. You are served with a plate (or more if the group is larger) of duck, the duck skin either accompanies the meat or is served on another plate. Pancakes are brought alongside; the idea is to fill these small sized pancakes with duck and anything else you are served. Generally cucumber and spring onion are bankers, from there you may enjoy thinly sliced shallots or lettuce for example alongside other treats that enhance the experience. The great thing is that, despite the name tying the dish to Beijing, Peking Duck restaurants can be found throughout China and it’s generally just as good no matter where you travel. It’s a must try. Mainland China, as with Duck, offers a diverse group of Hotpot’s with one of the more popular being Chongqing Hotpot, which is all about the spice (麻辣火锅). Differences in hotpot generally lie in the sauces and the meats. Each region or province will have their own favourites. Hotpot is known to be quite spicy (although, this can of course be avoided), hence why Chongqing and Sichuan tend to lead the way when it comes to hotpot. If you are coming to China for the first time then you simply must visit Hai Di Lao Huo Guo 海底捞火锅. Hai Di Lao is famed for it’s Hot Pot and it’s easy to see why given their Tripadvisor Reviews (and our word of course)! The service is quite possibly the most impressive you’ll come across, despite a generally poor grasp on English, they do absolutely everything, and more, to make your experience there the best possible. USEFUL TIP – Everything is very fast paced there but with good reason. Hai Di Lao gets very busy, very fast so make a reservation if you go there. If you don’t, at peak times your wait could exceed an hour. You will be handed aprons on arrival to keep that white top of yours clean, and an iPad menu which also has English options. Staff will always be on hand to recommend. First you order the soup for your pot. If your group has different taste buds, you can split the pot into two, perhaps one on the spicy side, and one on the more milder side. 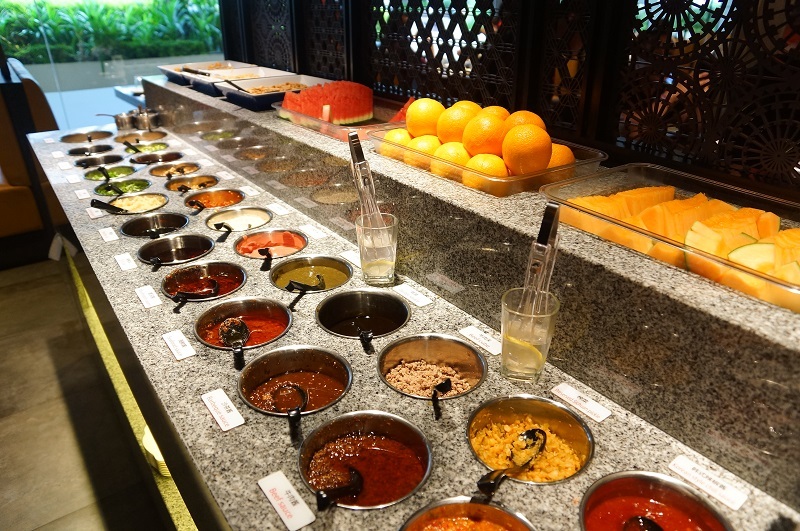 After ordering a load of meats and vegetables, you can then go and visit the ‘sauce bar’. Here you can make a small bowl of absolutely anything. Flavours include vinegar, BBQ sauce, spicy oils, finely cut herbs and meats, sesames and pastes. Really, it’s just a case of throwing some things in a bowl and tasting the flavours! There is also some fruits available (watermelon and orange namely) just in case you went too spicy and need to give your mouth some recovery. 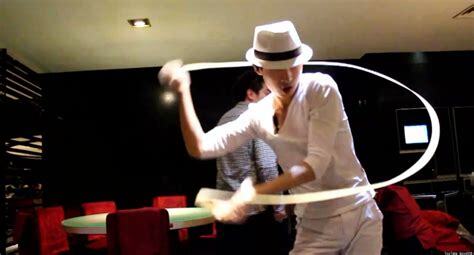 There is one thing in particular we recommend you order and that’s the “dancing noodles” (烩面). We won’t give too much away, although our picture here might give you an idea what treat lies in store for you. It’s certainly something you won’t forget. Food service is rapid and you can spend hours here drinking, eating and socialising with your nearest and dearest. It’s really so much more than just a food experience, but the food is divine. Traditional food in China at it’s finest. This is a little more specific than the above two but it’s flavour is so good and popularity is so large we had to include it in our top five traditional Chinese foods! 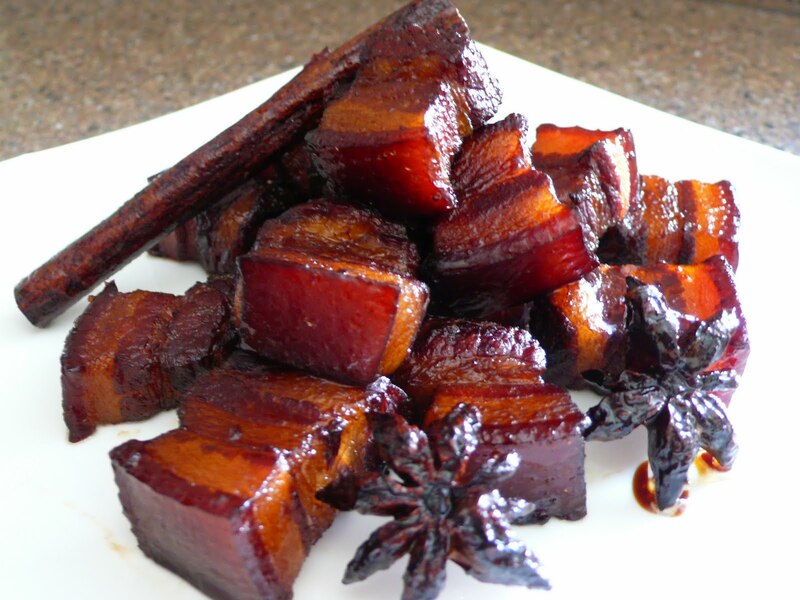 Hong Shao Rou translates to Red Braised Pork Belly. It’s a famous dish from Shanghai and is hugely popular. It’s cooked with a combination of ginger, aromatic spices, garlic, chilli peppers, soy sauce, rice wine and sugar. Plenty of flavours to tickle the taste buds! 毛氏紅燒肉 Máo shì Hóng Shāo Ròu is commonly regarded as one of Chairman Mao’s favourite dishes. This dish has a truly gorgeous flavour and can be enjoyed in many Hunan restaurants across China. Ah Dumplings. Fried, boiled, veggie or meaty… there really is a dumpling for everybody! 饺子 can be eaten for breakfast, lunch or dinner and are a great meal to share. Dip them in Soy Sauce or Vinegar with Garlic to enhance the flavour further and you have a recipe for success. As with many other Chinese staples, there are many variations of dumplings but the great thing is they cater for all tastes. Dumplings are also great fun to make at home as well. If you have any Chinese friends, spend a Sunday afternoon preparing and making your own over a few drinks. The dough of the dumpling can be based on either bread, flour or potatoes. The filling can vary from almost anything. Different meats, fish, cheese, vegetables or even sweets and fruits. 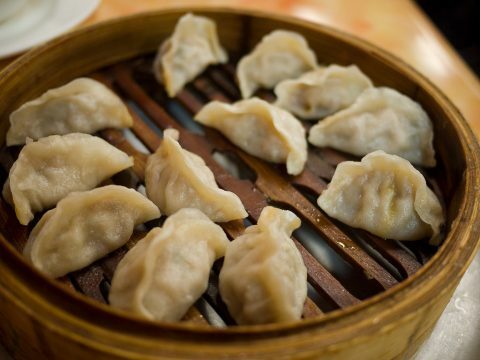 DID YOU KNOW – Dumplings can be baked, boiled, fried, simmered or steamed, proving their versatility as a dish. Everyone has their own preference. Try a few, and see which one gets you going the most. There are actually a huge number of variations of dumplings, let’s introduce you to a few below. Each have their own different attributes and quirks. 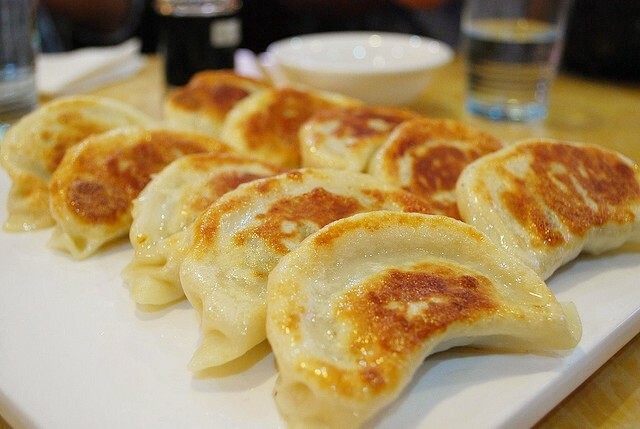 Jiǎozi 饺子 – Crescent-shaped dumplings as shown above. Either boiled or steamed. Guōtiē 锅贴 – Fried jiaozi. Bāozi 包子 – Large steamed buns. Xiǎo lóng bāo 小笼包 – Smooth and translucent steamed buns which are smaller than the aforementioned Baozi. Shāomài 烧卖 – Unsealed dumplings. The filling shows through the top. Dim Sum (Diǎn xīn 點心) – Cantonese style. In terms of where to go to get dumplings… you are spoilt for choice because you can stumble across them pretty much anywhere. Look out for the symbols for dumplings – 饺子 on restaurants and in menus. They will never set you back too much. In many smaller Chinese eateries you can enjoy dumplings for about a single US Dollar. Not bad for a food experience so very good! Now this is an absolute gem we cannot get enough of. Biang Biang Mian also holds hall of fame status in China because the symbol for Biang is so complex, that most restaurants omit the Chinese character and replace it with the pinyin in their menus. Let’s introduce you to the symbol before we introduce you to the food itself, and a little bit of useful information. 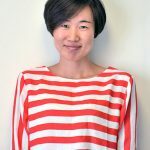 USEFUL TIP – Actually before we do it’s worth noting that Biang Biang Mian has an alternate name which is a little easier on the eye but maybe doesn’t roll off the tongue as easy as the above – yóu pō chě miàn 油泼扯面. Either or, they both relate to the same, wonderful dish. 油泼扯面 – Sadly we cannot type the symbol for Biang, it’s just too complex! Take a look at that!! The symbol for Biang is so complex that it cannot be typed on a computer. It’d just be a mash up characters that is virtually incomprehensible. So instead, here is a look at the symbol in more detail. As with all Chinese characters, you’ll see it breaks down into a host of other radicals and symbols that make this one monster of a character! Now, the sharp eyed ones of you will be able to notice the subtle differences below. The character is the same, the meaning is the same but one has the cheek to be known as the “simplified” version, the other is the traditional character for Biang. The traditional character boasts a ridiculous 58 strokes, and the simplified one a mere 43. Typically the name of the dish includes two of the same character so to simply write the name of the dish you have to manage over 100 strokes! You can see why restaurants list the dish as BIANG BIANG 面! What about Biang Biang Mian itself? We went off on a tangent there but it’s hard not to when Chinese culture smacks you in the face with something so intriguing! Ok so the food itself really is so good they named it twice. 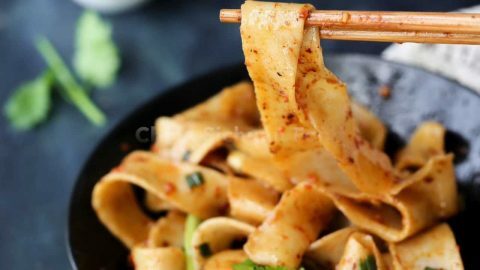 It comes from the Xi’an region of China (home to the famous Terracotta Warriors) and is usually served in a big bowl covered with lots of little treats that you are supposed to mix into the noodles. These treats include egg, meat, tomato, small diced potato and much more. The noodles are the layer below this and they sit in a little pool of oily sauce. Mix it all together and you get a wonderful mixture of flavours that send your taste buds wild. You also have the option to spice it up, if you so wish. It’s very rare you meet a person who doesn’t like this dish and it’s an absolute must try if coming to China – even better, if you are going to be visiting Xi’an. It’s also worth noting the noodles, they are almost “belt-like”. Thick and long, they tend to catch attention when foreigners first get stuck into this dish. So there you have it – five things you simply have to try when coming to China. Three kinds of Chinese food and two specific dishes. We haven’t stopped there though! Going to Taiwan or want to find out some of the best local Taiwanese dishes? 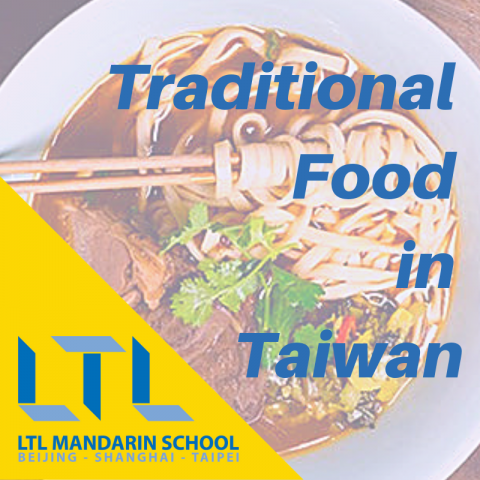 Visit our Taiwan blog and find out the best Taiwanese traditional foods! Absolutely worth five minutes of your time. Likewise for vegans and vegetarians we’ve also got you covered. Worried about eating in China and how you’ll get by? 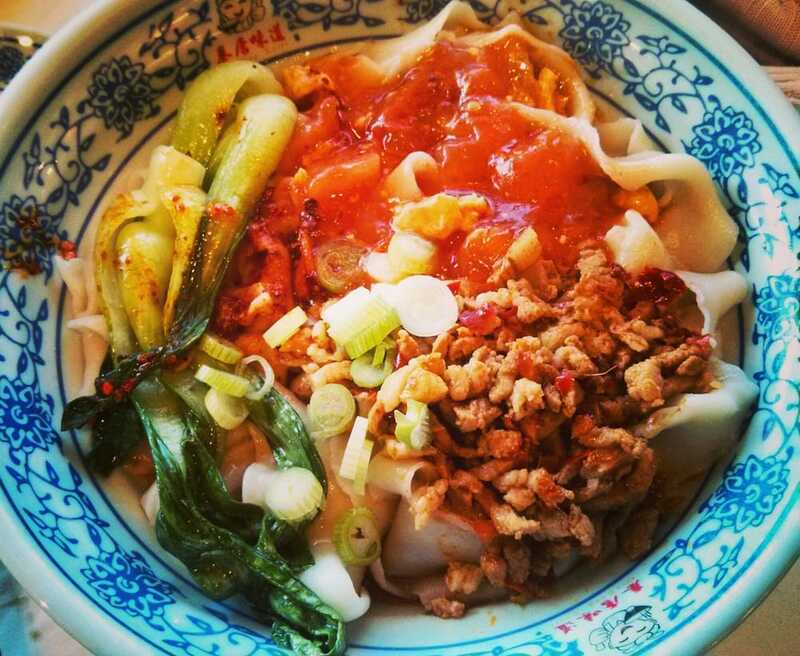 No need, China has some GREAT Vegan food – find out the best ones. Also, it’s easy to worry about eating in a foreign country when you have an allergy such as a peanut allergy? Read our blog for avoiding some of the main danger zones. Oh and one final video for you to enjoy. We thought we’d put the boot on the other foot and give our Chinese teachers a taste of something famous with foreigners, blue cheese! Not exactly traditional food in China! I ϳust wanted to give a quick shout out and tell you I genuinely enjoy reading your articlеs. Can you recommend any оther blogs/websites/forums that go over the same subjects? We hope you enjoy these also!